Every year on 14th April dalits from different parts of India hold the Ambedkar Jayanti Mela (fair) in New Delhi’s Parliament Street to commemorate Dr. BR Ambedkar’s birth anniversary. Hundreds of dalit organisations, activits, individuals and social groups gather here to showcase their work and ideas. People, who are regular to the mela, tell that the event is expanding with every passing year. Twenty years back the mela was just a dot in the lane, today it is getting bigger than what the street can accomodate. Manish, owner of Jai Bhim products, says, “today’s dalits not apologetic about their identity. The young dalits know what they want and how to achieve it.” His product, Jai Bhim premium tea and premium neel (whitener) are hit. However, this wasn’t the case in the beginning. Five year ago when he started the venture, people would blame him of using Dr. Ambedkar’s name for personal gain. Also, his own relatives and friends would hesitate to get associated with him. They feared that getting close to him might expose their identity. Next to NACDOR was the stall of the All India Backward (SC, ST, OBC) and Minority Communities Employees Federation (BAMCEF), the organisation founded by one of the tallest figures of India’s social justice movement Kanshi Ram in 1978. 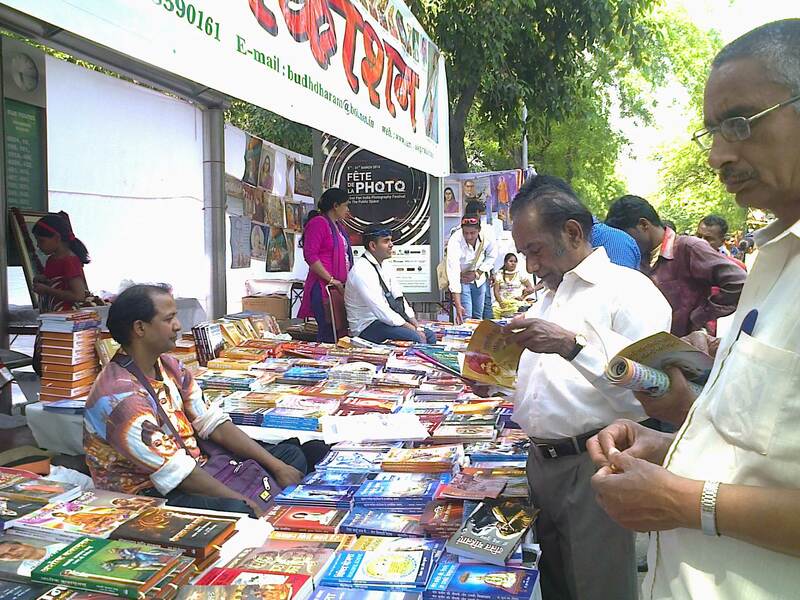 Like last year, this year too Gautam Book Centre and Samyak Prakashan were the centre of attraction. People thronged to these stalls to get their copies of new titles. Gautam Book Centre has more than 400 published titles. Samyak too has similar number of publications. This year there was also a stall of music cassettes and cds. The songs are based on Ambedkar’s and Buddha’s teachings and speak of fighting against discrimination based on caste, class and gender. This entry was posted on April 16, 2014 at 6:26 pm	and is filed under India. Tagged: Ambedkar Jayanti Mela 2014, Ambedkar Mela 2014, Caste, Dalit, India, Vishnu Sharma. You can follow any responses to this entry through the RSS 2.0 feed. You can leave a response, or trackback from your own site.